Over ice, feet up, sun shining... this is it!! 2. 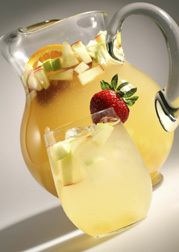 In a large pitcher or punch bowl, stir together gin, triple sec, orange and apples. Refrigerate 2 hours or as long as overnight. When ready to serve, stir in white wine and 1 cup mint syrup. Pour into ice-filled glasses, top with Cava, garnish with mint springs and serve. Girlfriend Factor is Coming to Port Angeles! 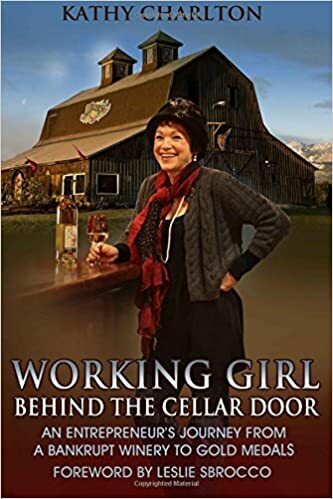 Fast forward to 2011 when, without hesitation, Olympic Cellars donated 12 cases of Working Girl Wine to be poured at an inaugural Wine, Chocolate & Shoes reception during Fashion Week El Paseo. In appreciation of their support it was mutually agreed to extend GFF’s Go Girl! Grants to women in the Port Angeles area. And to help launch the arrival and raise funds for ongoing grants in the area, Girlfriend Factor has been named as the beneficiary of a Random Manor concert to be held at Olympic Cellars on July 28th. To find out if you qualify for a Go Girl! Grant and to apply, go to the Go Girl! Grant page on www.thegirlfriendfactor.org. To learn more about the Random Manor concert to be held at Olympic Cellars on July 28th and other concerts in their summer series, go to www.olympiccellars.com. The Girlfriend Factor (GFF) is a non-profit organization whose mission is to celebrate and explore the powerful influence women have on each other’s lives through building friendships, sharing experiences, and providing financial support in the form of educational grants to motivated adult women so they may become self-sufficient. For more information on the Girlfriend Factor, please visit www.thegirlfriendfactor.org or call 760.772.9594. It’s rare in the music industry for a band to stay together for 30 years but Fat Chance has and is still a beloved part of the music scene on the Peninsula since 1982. 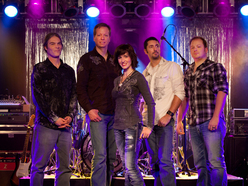 Max Fernandes, Jeff Joaquin, John Christensen and Doc Gardner were the original four band members. Doc, the drummer, has moved on replaced by Kent Demmel, another local talented musician. I’ve only lived on the Peninsula for 11 years and don’t even remember when I first got to hear Fat Chance play but I do know that I danced the whole night… never sitting out one dance. The band played lots of my favorites from the 50s to the 80s and their original music were songs that told stories about life on the Peninsula. My favorite was the Hot Tub song which was actually a stock tank heated by the kiln of a local potter. But as John told the story the song title was a bit longer… something about 7 N@#?D Ladies in a Hot Tub. Last night John and his wife, Dee, allowed me to interview them and share their memories via a box full of pictures going way way back. John estimates that the band has played over 2000 gigs. Dee started singing with the band and then formed her own bands, Olive and the Pits – 50s music, and also “Mom’s” band, their original music. The music scene on the Peninsula was hopping in the 80’s with 5 bands performing each weekend with folks strolling the streets listening to all the music. For a while John and Dee owned the Port Angeles Tavern which is now Bar 9. All the musicians are self-taught and play by ear. Practicing faithfully two nights a week in their studio (the lower level of John & Dee’s house) they would pick their favorite musicians and practice along with the music until they perfected the songs. Elvis, The Beatles, Neil Young and Creedence Clearwater helped influence their style. Their genre of music is definitely Rock n Roll that gets people on their feet and keeps them dancing. What kept this band together for 30 years? Music wasn’t their only jobs but it was their passion… A love of music, strong friendships, a deep love of the Peninsula and their families. Fat Chance has donated their time to many fundraisers over the years including the Boys & Girls Club, Duck Derby, Festival of Trees, Museum & Arts Center and Beyond Cancer. Never ‘hitting the road’ like most bands they played proms, weddings, festivals and even an Inaugural Ball. Max was also well known for his Elvis performances. Gene Stashuk is the “sound guy” for Fat Chance pushing the band through long rehearsals for each of their two CDs which he produced. He is also the former Red 7 lead singer and guitarist. An internationally known musician, songwriter and the magician on sound, Gene has worked with Bonnie Raitt, Aretha Franklin and was on tour with Michael Jackson. As I listened last night what hit me the most is that The Fat Chance Band has become part of the “memories” of so many on the peninsula… multiple generations. If you opened their photo albums I’m sure you will find The Band in the background surrounded by happy dancers. Thank You Fat Chance for 30 years of your music. In Concert, July 14 at Olympic Cellars. Music begins at 7 p.m.
Tickets can be purchased on-line or at the door.